After following the activity, public which wish to embrace Islam led to say two creed sentences ( syahadatain). From word Syahadatain that is then emerges term Sekaten as as result of uttering change. 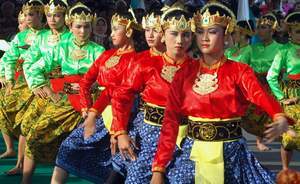 Sekaten always grows and performed [a] routinely per annum along grows it Kerajaan Demak becomes Kerajaan Islam. And so do at the time of shifting it Kerajaan Islam to Mataram and when Kerajaan Islam Mataram divided two ( Kasultanan Ngayogyakarta and Kasunanan Surakarta) Sekaten still be performed routinely per annum as Islam culture heritage. 1. Sounded it two peripherals gamelan ( Kanjeng Kyai Nagawilaga and Kanjeng Kyai Guntur Madu) in Kagungan Dalem Pagongan Masjid Agung Yogyakarta during 7 day successively, except Thursday night until Friday noon. 2. Commemoration of birthday Nabi Besar Muhammad SAW on 11 Mulud night, having place of in gallery Kagungan Dalem Masjid Agung, with Bacaan history Nabi by Abdi Dalem Kasultanan, the consanquinities, functionary, and public?people. 3. Giving of alms Ngarsa Dalem Sampean Dalem Ingkang Sinuwun Kanjeng Sultan, in the form of Hajad Dalem Gunungan in ceremony Garebeg as top ceremony sekaten. Activity of supporter event is carrying out of Pasar Malem Perayaan Sekaten during 39 days, this event become fascination for public Jogja and also outside Jogja.